Since the launch of his eponymous brand in 1999 François-Paul Journe has created technically extraordinary watches with immediately recognizable designs. The Octa collection of which this Octa Lune is a member, uses Journe’s first automatic winding caliber (the Resonance and Tourbillon models were manual). The technical feat here is the Cal 1300 movement that was designed to integrate different complications without modifying its dimensions. 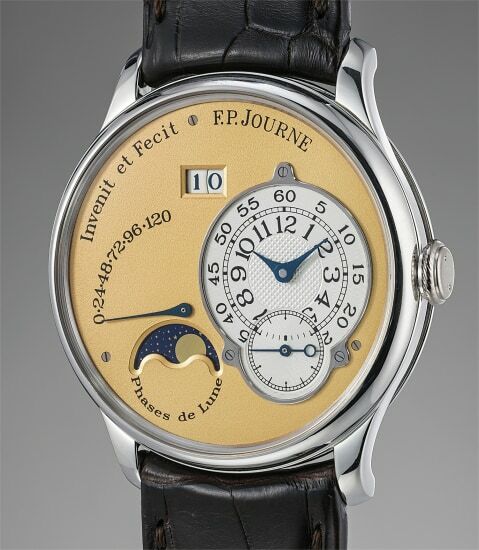 The present Octa Lune (moon in French) features Journe’s signature offset time telling functions on the right side of the dial whereas the large date, power reserve indicator (even though the movement has a seven day power reserve only the first five days or 120h have guaranteed chronometric precision) and moonphase display are placed on the left hand side of the dial. The Octa Lune was launched in 2003 and won the “Best Men’s Watch” award, in the same year, at the Grand Prix d’Horlogerie de Genève (GPHG) - the most prestigious award ceremony in the watch industry. In 2004/2005 Journe decided to create a rose gold movement for its watches and increased the dimensions to 40mm, which makes the present Octa Lune in a 38mm platinum case and brass movement, an extremely limited version that was made for about a year. The present Octa Lune in excellent condition epitomizes Journe’s philosophy of technical expertise, design acumen and legibility and is a wonderful opportunity to own an extremely rare piece from one of horology’s greatest artisans.